A passport is a travel and identification document that is accepted by governments around the world. You need a passport to enter and return to the United States from most countries, and it's worth getting, even if you don't have any upcoming travel planned. It's usually better to get a passport through the U.S. government, and not a commercial passport application agency; even if you need to get a passport fast, they won't speed up the process any more than you can. Step 1: The first step requires you to download the relevant U.S. government forms. You can grab a passport application from any U.S. post office, or download the passport application forms online and print them out from home. If printing, note this advice from the government: "The forms...must be printed in black print on white paper. The paper must be 8 1/2 inches by 11 inches, with no holes or perforations, at least medium (20 lb.) weight, and with a matte surface. Thermal paper, dye-sublimation paper, special inkjet paper, and other shiny papers are not acceptable." Step 2: Once you have the passport application form in hand, start by reading the instructions that are printed on the first and second page. Complete page 3 using this information, and then read page four for further details on filling in the form. Step 3: Next, you need to gather proof of your American citizenship, in the form of any one of the following, according to the U.S. Department of State. Certified U.S. birth certificate issued by the city, county, or state (not a copy). Call the government of the state in which you were born to get an official version with a notary's seal. Know that the birth certificate must list the full name(s) of your parent(s). If you don't have a birth certificate, you can still get a passport. Step 4: Get two passport photos taken to submit with your application. In your photos, you should make sure to wear your normal, everyday clothes (no uniforms) and nothing on your head. If you usually wear glasses or other items that alter your appearance, wear them. Look straight ahead and don't smile. You can get your U.S. passport photos taken at the post office—they'll know the drill and requirements. If you get passport photos taken elsewhere, read up first on passport photo requirements to make sure they'll qualify. Step 5: If you don't have your Social Security number memorized, write it down and add it to the materials you've assembled or bring your Social Security Card with you for the passport application. Step 6: Prepare to pay the application and execution fees; get those dollar amounts online as they change periodically. As of 2017, passport fees are $110 plus $35 for adults (ages 16 and older). For an extra $60 plus overnight fees, you can get a passport fast (more on rush time frames in Step 8). Check with the location where you'll be applying to find what payment methods are accepted, and then gather the money for payment. Step 7: Get a passport! Find the passport office location nearest you (it might just be the post office). Hand in your completed forms, passport photos, and money for the passport. Provide your departure date for your next trip and you can then expect to receive your U.S. passport in two weeks to two months. For an additional fee of $60 plus overnight delivery fees, you can rush a U.S. passport application, and you may even be able to get a passport on the same day that you apply. Step 8: Check your application status. Beginning about a week after you submit your application, you can check your application's status online to see when your passport might arrive. The US passport fee is $110 (plus $35 fee) if you are 16 and older, and the U.S. passport is good for ten years. The US passport fee is $80 (plus $35 fee) if you are under 16, and the new passport is good for five years. 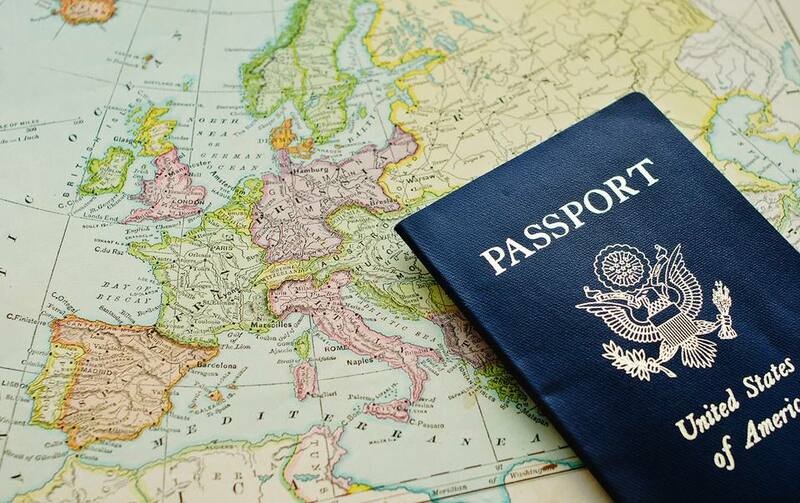 Some countries require that your passport be valid for a six month period after you leave that country for return to the U.S. Make sure you apply for a new one while you have plenty of valid months left on it. Remember that you need a passport or other WHTI-compliant document to travel back to the U.S. from Mexico, Canada, the Caribbean, and Bermuda. Leave a copy of your passport at home, and email a copy to yourself with other important travel documents. If you lose your passport overseas, having a copy will make getting a temporary or replacement passport far easier. Note: Passport books are different than passport cards. How to recover quickly if your passport is list or stolen.